With the recent wet weather, and sometimes warm sunshine, all the vegetables are growing apace. The broad beans were first to arrive and they are absolutely wonderful, sweet and juicy, and a very good harvest. In the tunnel the french beans are also yielding well so lots of beans in our boxes this week and also on our plates! 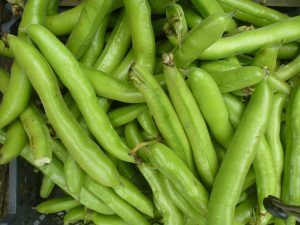 In addition the sugar snap peas are cropping well, plumper than the traditional mange tout, they are eaten whole and are very sweet and make an excellent addition to either hot meals or in salads. The beetroot are also just about ready, again sweet and succulent and good both hot and cold. This season’s spinach is very green and leafy and the rainbow chard speaks for itself, lots of different colours and full of flavour and vitamins. Surprisingly the Summer Purple Sprouting has appeared already – earlier than anticipated – in fact it doesn’t seem that long ago that we were picking the winter variety. Planting is still continuing apace and of course everything which we have planted out is growing fast, the courgettes will soon be large enough to harvest and if we get suficient sun strawberries will arrive shortly.